This past year has been a year of many “firsts” for the oncology community. The field witnessed several revolutionary advances in the research and treatment of cancer, including the U.S. Food and Drug Administration (FDA) approval of an immunotherapeutic to treat patients based on biomarkers rather than the site of tumor origin; the approval of the first CAR T-cell immunotherapy; and the approval of a comprehensive next-gen companion diagnostic test to identify the right patients for the right molecularly targeted therapeutic. Also in 2017, the FDA approved the FoundationOne CDx test, which can detect genetic mutations in 324 genes and two genomic signatures in any solid tumor type, and the first “biosimilar” cancer drugs, which could potentially help drive down the costs of some cancer treatments. Another win for the community came in the form of corrective statements from tobacco companies warning of the dangers of smoking cigarettes. Because smoking is responsible for a large proportion of cancer incidence and deaths, there is hope that these statements, in the form of newspaper and television ads running through March 4, could help educate the public and alleviate some of the burden of cancer and health care costs in the future. But there is so much more to do. While immunotherapies lead to long-lasting responses for some patients, a sizable portion of patients do not respond to these agents; some patients who respond ultimately develop resistance; and we still do not have precise biomarkers to predict who will respond and who will not. The same can be said about targeted therapies, where challenges with treatment resistance continue to be a major roadblock. Above all, patients from underrepresented and underserved communities quite often do not benefit from cancer prevention, diagnosis, and treatment advances. 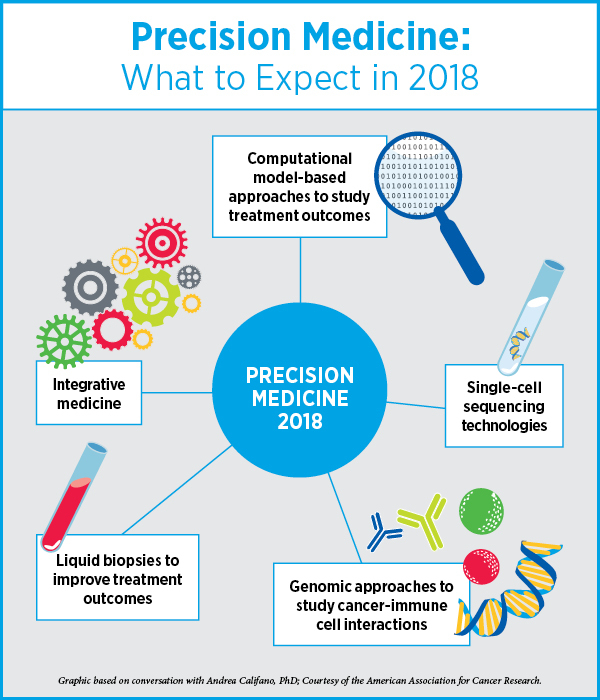 We asked experts in the fields of immunotherapy, precision medicine, and prevention and disparities research where the cancer research community is headed next and what major accomplishments we might expect in 2018 to take us closer to conquering cancer. 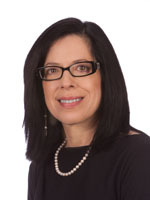 “We are starting to define cancers based on what their genetics tells us and how the immune system sees them,” says AACR President-Elect Elizabeth M. Jaffee, MD. Jaffee, who is the Dana and Albert “Cubby” Broccoli professor of oncology and professor of pathology at Johns Hopkins University School of Medicine and the Sidney Kimmel Comprehensive Cancer Center at Johns Hopkins, and associate director of the Bloomberg~Kimmel Institute for Cancer Immunotherapy at Johns Hopkins, predicts that this year we will see approval of anti-PD1/PDL1 and anti-CTLA4 antibody therapeutics, as single agents or as combinations, for smaller subsets of different cancers. The pace at which immunotherapeutics, particularly monoclonal antibodies that target the PD-1/PDL1 axis, are being approved is unprecedented. The first anti-PD1 antibody was approved in 2014 to treat melanoma; this class of therapeutics has now been approved to treat 10 different types of cancers. “We are going from treating melanoma or lung cancer to treating smaller subsets of genetically linked cancers that have a high mutational burden, where anti-PD1/PDL1 antibodies work very well,” notes Jaffee. She predicts that we might see more biomarkers associated with the immunotherapeutics being approved, in addition to microsatellite instability (MSI)-high tumors. 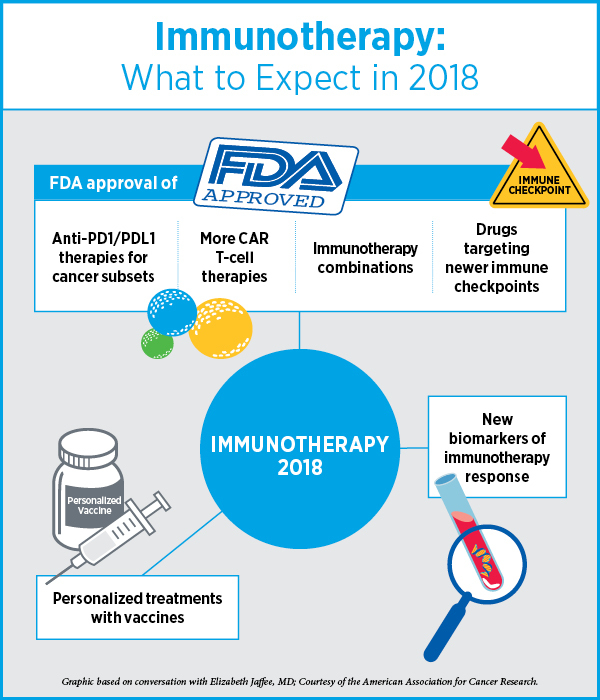 The second area to look forward to in 2018 involves newer immunotherapy targets, Jaffee says. As our understanding of the PD1/PDL1 pathways continues to expand rapidly, researchers are now starting to study other brakes on the immune response that a tumor can use. Several new antibodies currently being tested in clinical trials are showing activity, notes Jaffee. The newer antibodies include those that target monocytes, such as the CSF1R inhibitor, and some that target metabolic pathways, such as the CD73 inhibitor. “Therapeutics targeting these new immune-modulatory pathways are looking good in early studies, so I suspect that we may see some of these antibodies approved for at least one of the many cancers that have suppressor monocytes,” Jaffee says. We are likely to make progress with other groups of agents that target activators of T cells, such as OX40 and CD137, Jaffee speculates. Unlike PD1 and CTLA4, which downregulate T cells, these molecules accelerate the T cells. Agents targeting these T-cell accelerators are being tested in clinical trials and we may see the first ones being approved this year, she notes. We might also witness more CAR T-cell therapies approved for B-cell cancers targeting small subsets of patients, she says. We are likely to see more clinical studies on therapeutic vaccines, including mRNA vaccines, DNA vaccines, and those that involve utilizing patients’ tumors to develop personalized vaccines, in combination with other immune agents, notes Jaffee. There are a couple of challenges as we make progress, she said. One is understanding the tumors and immune system of the 80 percent of patients who are not responding to immunotherapies. “We are conducting many clinical studies to understand responders versus nonresponders,” she notes, adding that one of the Cancer Moonshot Blue Ribbon Panel recommendations was to fund more studies that help understand the biological differences between responders and nonresponders. “We also need better technologies to understand what it is that the T cells are seeing,” Jaffee says. We now know that tumors with high mutational load are likely to respond better to immunotherapies that those with a low mutational load. But the T cells only recognize certain neoantigens among the thousands of them present on the tumor cells. “What are these good-quality neoantigens? Can we target them?” asks Jaffee. While we are very optimistic about CAR T-cell therapies for B-cell type cancers, using this technology to treat solid tumors poses several challenges, and researchers are beginning to make progress, adds Jaffee. “There is a lot of good science coming out right now, and I think we have the right tools to follow up on these advancements to make noticeable progress,” says Jaffee. This is also a great time for patients to go on clinical trials, she explains. Until recently, patients participating in a clinical trial were not doing it for themselves but for future knowledge; now, with these new therapeutics, it is not that unlikely that patients will have a clinical response in early-stage clinical trials. 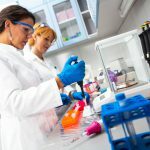 As an example, the hypothesis that MSI-high tumors would respond to the anti-PD1 pembrolizumab was tested in a small phase I study at Johns Hopkins by two investigators; but data from this small study were adequate for the pharmaceutical company to get FDA approval to treat MSI-high tumors anywhere in the body with this drug. “For a while now, we have been using approaches of association – application of statistics to associate an event, such as a mutation in the tumor, with a specific outcome,” begins Andrea Califano, PhD, Clyde and Helen Wu Professor of Chemical Systems Biology at Columbia University Medical Center. 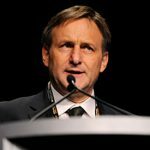 “One of the things that’s going to happen in the next couple of years is that we are going to see a transition from such purely associative approaches to approaches that are more and more model-based, which can provide us with greater ability to analyze multi-dimensional omics data to identify the key mechanistic dependencies of cancer cells,” he notes. “We are running a major symposium this year at the AACR Annual Meeting 2018 that is dedicated to addressing the role of model-based approaches in the clinics,” says Califano, who is chairing the session. There have been significant scientific contributions in this area in the last few years that may lead to novel strategies for targeting cancer cells, he says. Another thing to look for in the near future are more integrative approaches to precision oncology, according to Califano. “We have all been infatuated with the idea that there may be a single magic bullet for solving the cancer problem,” for instance by using targeted therapy or immunotherapy approaches, but such views are “rather simplistic,” Califano cautions. “Cancer is a complex disease requiring equally complex solutions that can only be achieved by embracing an integrative and quantitative approach.” Califano speculates that integrating mutation-based targeted therapy and immunotherapy approaches with complementary approaches, such as RNA- and proteomic-based ones, is the next logical step for making precision oncology more “precise” and ultimately more valuable to the patient. “One of the most compelling ‘big things’ emerging in the current research landscape is the use of single-cell technologies,” notes Califano. These approaches are going to revolutionize the way we think about cancer, he says. Single-cell sequencing technologies will allow us to focus on tumor-initiating cell states and on drug-resistant states that emerge following targeted treatment, he adds. There is also significant attention on the utilization of genomic approaches to understand how to reactivate immune responses by targeting the cancer’s cell autonomous contribution to immune evasion, Califano explains. Focusing on the cancer cell-autonomous compartment that induces immune evasion will provide critical insights that could in the future benefit patients in significant ways, he says—for instance, by reducing the toxicity associated with approaches that target the immune system as a whole. In addition, several laboratories are developing better biomarkers to predict immunotherapy response with acceptable ranges of false-positive and false-negatives that will support their clinical application, he notes. Finally, liquid biopsies are becoming integral to the landscape of precision oncology, Califano says. For example, liquid biopsies can potentially detect relapse months earlier than currently possible with traditional methods, such as imaging, Califano notes. This allows the oncologist to switch treatment before the tumor has a chance to become further differentiated, adding to our ability to better control this disease, he says. Califano also points to the challenges with utilizing artificial intelligence (AI) in assisting physicians with identifying the right treatments for patients. Most AI approaches use unconstrained machine-learning based approaches that are completely data-driven but largely ignore the mechanistic constraints imposed by the biology of cancer, a major limitation, as he explains. “The use of biology-driven models, for instance based on the underlying regulatory logic of cancer cells, can dramatically simplify our ability to extrapolate realistic conclusions, compared to unconstrained machine-learning methods,” he adds. For example, looking at all the sites in the genome that harbor a genetic alteration can produce a huge number of candidates. However, when considering which of these can actually produce relevant downstream effect, given the signaling and regulatory logic of the cancer cell, can limit the truly relevant ones to only a handful, he notes. The relationship between the individual elements that make up the data on supermarket purchases are relatively sparse; however, in cancer cell biology, the relationships are extraordinarily complex with each protein interacting with hundreds of other proteins, metabolites, and possibly affecting thousands of regulatory target genes, explains Califano. “Even if we used an ultra-simplified model where the roughly 20,000 genes in a cancer cell can only be in ‘on’ or ‘off’ state, each cell could exist in one of 2 to the power of 20,000 possible states. Compare that with the about 2 to the power of 250, which is the total number of atoms in the universe. To avoid being ‘lost’ in this extraordinary complex landscape, cells rely on an extraordinarily complex web of molecular interactions that reduce the number of viable states to only a few thousand. Building complex predictive algorithms that ignore these constraints can either be unfeasible or significantly limit our ability to be precise in our predictions,” he adds. “The complexity of biology requires novel paradigms for analyzing and interpreting large data sets, both from a genomic perspective and from a computational analysis perspective, and I am very excited about the possibilities and the direction the field is taking to ultimately individualize cancer care on a truly quantitative and predictive basis,” Califano says. “We have made some progress in addressing cancer health disparities but we still have a long way to go,” says John Carpten, PhD, professor and chair of the Department of Translational Genomics, professor in the Department of Urology, and director of the Institute of Translational Genomics at Keck School of Medicine at the University of Southern California. “We are finally seeing a time where there are significant talks between social/behavioral scientists and basic/translational scientists in embracing interdisciplinary approaches to constructively address cancer disparities,” adds Carpten, who is a member of the AACR Minorities in Cancer Research committee. There are still significant gaps in cancer screening among minority populations, notes Carpten. For instance, while it is now widely recognized that colonoscopy can significantly reduce mortality rates from colorectal cancer, screening rates for this cancer in underrepresented and medically underserved communities continue to remain inadequate. Similarly, cervical cancer rates are higher within some underrepresented communities and the medically underserved because of gaps in the utilization of and access to cervical cancer vaccine, which could be improved upon, Carpten notes. 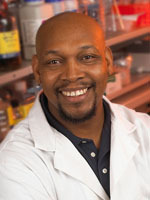 While it is well recognized that factors related to race, socioeconomic status, and environmental factors influence cancer health disparities, there is a significant dearth of information on the biology of cancer for patients from underrepresented communities, such as African-American and Latino populations; this is despite the fact that many cancers, such as prostate cancer, triple-negative breast cancer, colorectal cancer, bile duct cancer, pancreatic cancer, and multiple myeloma, disproportionately affect these populations, says Carpten. Much of the basic research, including genomic data that populates currently available large databases, predominantly includes patients of European descent, Carpten notes. “We need to do a better job of providing information on more diverse patient populations when it comes to molecular profiling,” he adds. In a recent study published in Cancer Discovery, researchers performed whole-genome sequencing on about 100 prostate cancer tumors from African-American patients and identified several gene mutations not previously observed in this population, including mutations in the gene ERF. “This is the first report of alterations in the ERF gene in African-American patients because they had a large cohort of patients to study,” notes Carpten. In another recent study, investigators, including Carpten, found that the mutation profiles were different for African-American and Caucasian patients with multiple myeloma. Interestingly, p53 mutations, which are a marker for poor outcome, were far more frequent in Caucasian patients than African-American patients, suggesting that the poor outcomes seen in African-American patients may be related to factors such as access to care rather than them having tumors that are biologically more aggressive. “Data from studies such as these are providing rationale for why we need to do a better job of recruiting and collecting tumor samples from more diverse patient populations for cancer genomics studies and molecular profiling,” Carpten says. 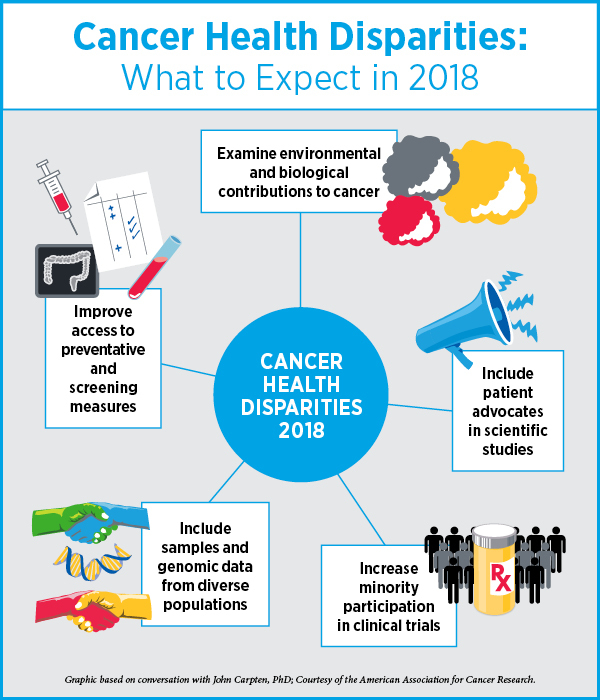 We need to see significant improvements in clinical trial accrual, especially in large phase III trials testing new therapies focused on cancers that disproportionately affect minorities, Carpten notes. He says that this has been a recurring problem for decades and adds that it is time to find new and improved ways to include clinical investigators who are knowledgeable in recruiting patients from underrepresented populations into clinical trials. “We have to do a better job of including advocates from the community into the clinical trial recruitment platforms,” he says. 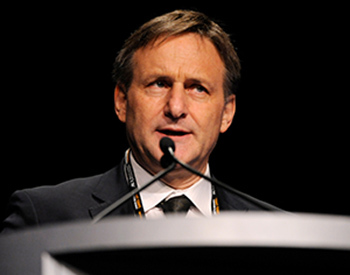 “There is this unfortunate reality that as we continue to battle with nationalized health care and the best way to implement it, we will also continue to see a greater divide among communities in access to quality and innovative health care,” Carpten notes. “This is another incredible reason why we have to continue to not only engage but involve minority communities in these processes, and that happens to be a strength of the AACR. I hope to see this organization continue to be a leader in galvanizing advocacy and survivorship communities and integrating them into the scientific community, particularly in relation to translational research and clinical trials,” Carpten says. Editor’s note: In a further effort to reduce cancer health disparities, AACR President Michael A. Caliguiri, MD, is spearheading 2020 by 2020, a collaborative effort to bring AACR Project GENIE, ORIEN, PELOTONIA, and the Biden Foundation together to sequence 2,020 cancer genomes from African-American/Black cancer patients by 2020. This effort is expected to contribute to the assembly of a national cancer data ecosystem that has mined patient data to predict future patient outcomes in minority and medically underserved populations.